Snowshoes come into their own when the snow is fresh and deep. If you were to venture out in these conditions just wearing your regular walking boots you’d quickly sink up to your knees in the fresh powder! However, strap a pair of snowshoes to your walking boots and you’ll suddenly find that your weight is spread across a wider area and the going is much easier. Both adult and kiddie size snowshoes are available for hire but if you go on a snowshoe walk with a qualified local guide (our recommendation) then they, along with the poles, will be provided free of charge. 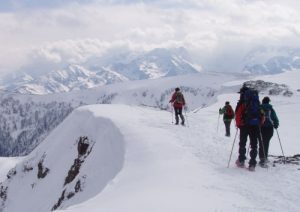 There’s no excuse for the whole family not to enjoy the beauty of the mountains of France on your winter holiday. Snowshoes enable you to explore picturesque woodland tracks with their snow covered trees and get up high and experience breathtaking mountain views. 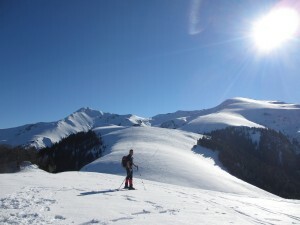 We always recommend snowshoeing with a guide in the winter. These local professionals know the lay of the land better than anybody and can safely take you off the beaten track. An enriching experience is guaranteed! Airboard is a relatively new activity that is really starting to take off in the French Pyrenees. If you have teens who are seeking an adrenaline buzz on their alternative winter holiday then this will get them hooked, trust me! 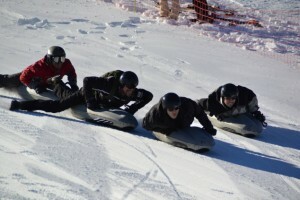 An airboard is an inflatable kevlar coated cushion with handles on its sides. You lay on your front, grab hold of the handles and then launch yourself down the snowy slope, using your feet and bodyweight to steer and stop the cushion. Hurtle down a dedicated airboard slope at one of the local ski stations at the Le Mourtis ski station in the Pyrenees. Or join your airboarding expert after the ski slopes have closed at the end of the day and test your mettle on a longer and more physically demanding descent. Those of you are particularly adventurous may prefer the full day out experience of guided Freeride Airboard. The deflated airboard is stowed in your backpack while you snowshoe up a peak in the Aran Valley in Spain. 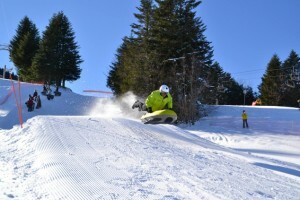 At the high point you’ll inflate your airboard using the special pump, hop on board and hurtle back down the hillside! What fun! Fatbiking has to be one of my favourite activities in the winter. A fatbike is basically a mountain bike but with superfat (95mm or wider) tyres. These tyres are run at very low pressures in order to achieve better traction on powdery snow. 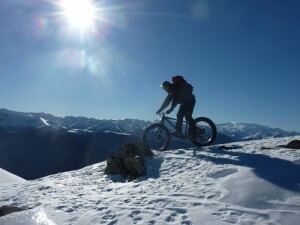 There are numerous mountain biking tracks and trails that thread their way around the ski resorts in the central French Pyrenees. In winter, this is the perfect environment for the fatbike. You can count on your qualified local guide to take you on the most fun circuits on offer that also afford the best views. It’s a blast! The best part about having a bash at all these different activities on your winter holiday in France? You’ll have earned the right to indulge in all those local gastronomic specialities, of course. 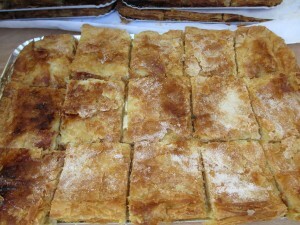 Melt in the mouth buttery pastry encloses an apple or bilberry filling – croustade! In the Pyrenees, enjoy the ‘Croustade’ with its melt-in-the-mouth buttery pastry filled with a puree of bilberries or apples. If savoury is more your thing then you should indulge in the aged and cured hams produced from local native breed pigs. Then there is the fantastic variety of cheeses produced from ewes’ and goats’ milk from animals raised in the mountains. Mmmmm. Now is a great time to book that alternative winter holiday to France.